Το Φύγαμε για ελληνικά! είναι ένα βιβλίο που προσφέρει στους μέσου επιπέδου σπουδαστές της νέας ελληνικής γλώσσας την ευκαιρία να βελτιώσουν τις δεξιότητές τους στην κατανόηση γραπτού και ακουστικού λόγου καθώς και να εμπλουτίσουν το λεξιλόγιό τους. Φύγαμε για ελληνικά! (Off we go to learn Greek!) 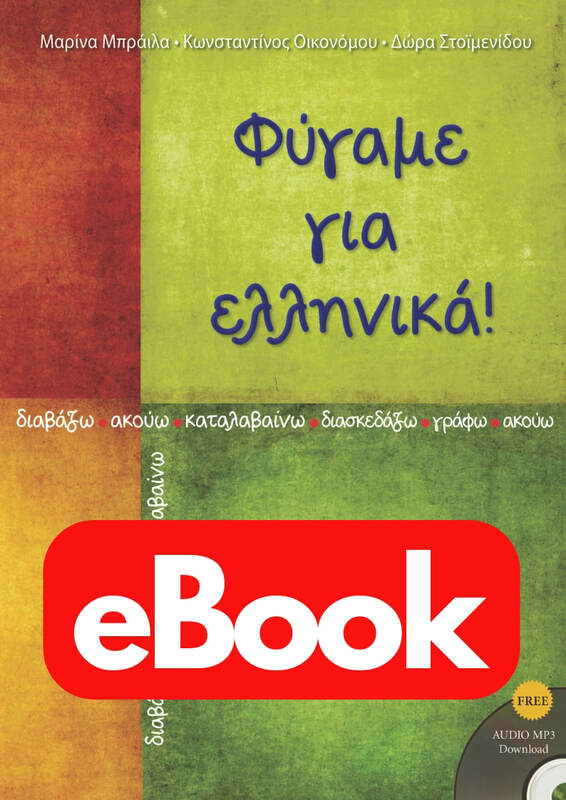 is a book that offers foreign students of Modern Greek who are at an intermediate language level, opportunities to practise their reading and listening comprehension skills as well as to enrich their vocabulary. En route pour le grec! 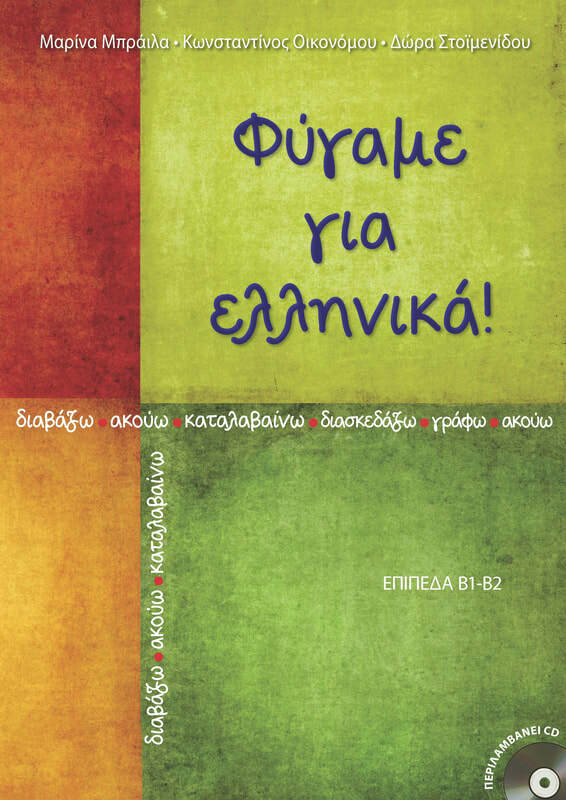 Le livre «Φύγαμε για ελληνικά!» (En route pour le grec!) offre aux étudiants possédant un niveau moyen de connaissance du grec moderne la possibilité d’améliorer leur compréhension écrite et orale de la langue et d’élargir leur vocabulaire. Los geht es mit Griechisch! (Los geht es mit Griechisch!) ist ein Buch für ausländische Lerner mit fortgeschrittenen Kenntnissen der neugriechischen Sprache. Es bietet die Möglichkeit, das Lese- und Hörverstehen zu üben sowie den Wortschatz zu erweitern. ¡Venga, vamos a aprender griego! «Φύγαμε για ελληνικά!» (¡Venga, vamos a aprender griego!) es un libro que ofrece a los estudiantes extranjeros de griego moderno que se encuentran en un nivel de idioma intermedio, más oportunidades para practicar su lectura y comprensión oral, así como para enriquecer su vocabulario. 'Φύγαμε για ελληνικά!' is the result of the long teaching experience of the writers at 'OMILO Greek Language and Culture'. So, if you dream of learning Greek in cosmopolitan ​Athens, the picturesque city of Nafplion in Peloponnese or the majestic islands of Syros and Lefkada, just join us! ​ For more info, please visit: www.omilo.com.